I was probably four when my dad came home from the mediation conference practically drunk on the Holy Spirit. He had a new phrase too, one that would be spoken to us many many times. “Words of life, girls, words of life!” We joke about it now. Sometimes those words were not spoken in the most life-giving of tones. But the message stuck, your words hold power. Things live or die by the power of the tongue. As a parent I see how true this is. We carry the story of our early years throughout our entire lives. Parents insist that their child has always been that smart, that talkative, that stubborn, that relaxed. When the child is thirty something and winning an award, we parents insist we knew all along. Even from the womb my child was this way, we say. I do it with my own two girls, attribute innate characteristics to their lives yet mostly un-lived. The first one came just 7 hours after I started laboring. At not yet two she is always full speed ahead. My 4 month old had me in latent labor for three weeks. The contractions didn’t bother her and she has already earned the nickname “Chill-a, Priscilla.” Nothing fazes her, nothing. This is where the words I speak matter. The way I frame the mantels my children will carry is important. My oldest daughter (as my friend put it) has “strong self advocacy.” She is not a fit thrower, or a brat. She is practicing advocating for those who cannot shout for themselves. I hope that one day she is a voice for those without one. This doesn’t mean that I give in to every “full body affect display” but it makes me a tad more willing to be patient as she tests my boundaries. She is learning what works and what does not. This is an important lesson. It may be annoying that my daughter stops to laugh at all the things her little mind finds funny, but if she is “the funniest person I know” –And I promise you, the Peanut is hysterical– then it is easier to not rush. She is simply exercising her amazing sense of humor, not trying to purposely make us late. I shouldn’t be surprised that this is the thing that has been pressing on my heart. My husband is getting his PhD in rhetoric. He studies how we shape words, how words shape us. He explained to me that there is no solid definition for words like patient, loving, kind. We just know them when we see them, and when we proclaim them, we notice them. So, the more I tell my daughters they are children of God, the more they become them in action, but also in my mind. So what I say, is what I notice and reinforce and sure enough those beautiful things manifest. So much did this resonate with me that I wrote a series of rhymes to remind my daughters and I what exactly is true about us. I want to cover my girls in those words of life. I want the mantels they carry to be blessings and not burdens. I want the truth of God to run through their lives, and the place that running starts….is out of their mother’s mouth. 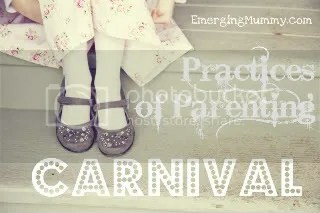 This post was written for a Blog Carnival! Hit the button and check some other ones out! “So, the more I tell my daughters they are children of God, the more they become them in action, but also in my mind. So what I say, is what I notice and reinforce and sure enough those beautiful things manifest. So much did this resonate with me that I wrote a series of rhymes to remind my daughters and I what exactly is true about us. Gorgeous. I’m a Presbyterian Minister…The title is/used to be Minister of the Word and Sacrament so words and language matter so much to me. Love the reminder of blessings and not burdens. Thank you, Ministe of the word…I love that. This is absolutely one of my favourite things that we do in our home, too. Love it. “So what I say, is what I notice and reinforce and sure enough those beautiful things manifest….” beautiful truth here. Our kids do, in so many ways, become what we expect them to be, what we say they are. It’s a powerful thing this shaping of our children’s hearts by the words we speak to them. Thank you for this beautiful post. Thanks. I teach high school English as well. I am sure that half of my job is convincing the kids they are smart and capable. Then, they just do because they are.